Netflix shares are up 12% after-hours, entirely erasing the losses post Q2 earnings after smashing expectations for Q3 subscriber growth and releasing "stellar" Q4 guidance. Much of the growth came from international markets, with Asia seen as contributing to its "strong growth." 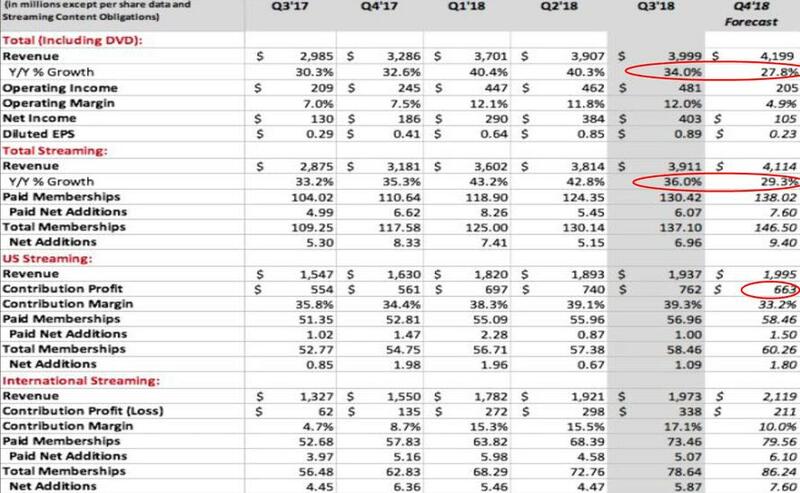 So that is two quarters in a row that Netflix they massively mis-estimated their subscriber growth, crushing bulls with Q2 earnings and bears with Q3. 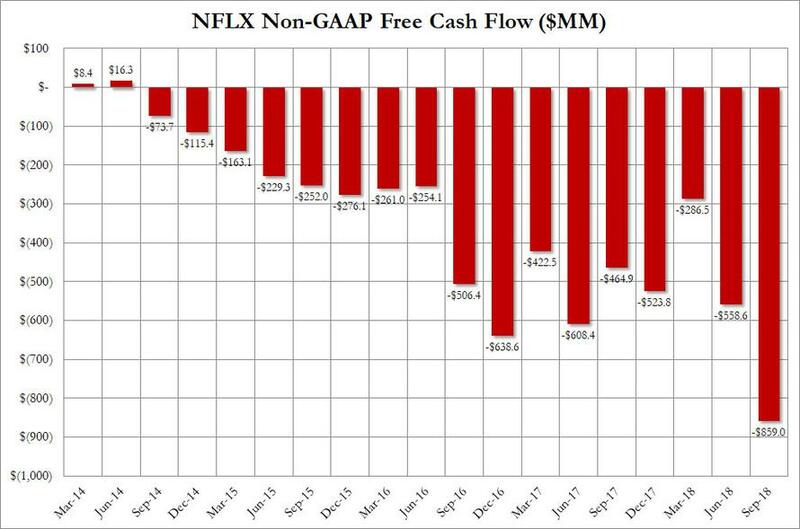 Additionally, Netflix sees Free Cashflow closer to -$3B Than to -$4B for 2018 (and next year's negative Free Cashflow roughly the same as 2018). And here is the one number that everyone on Wall Street will desperately struggle to avoid mentioning: in Q3, Netflix burned a record $859 million in cash, or about 10 million per day in the third quarter. Which leads to the next question: how much will Netflix spend on programming next year, While the company did not address this, it did say it has spent $6.9 billion so far this year. That means the company is on pace to surpass its previous forecast (of $7 billion to $8 billion). 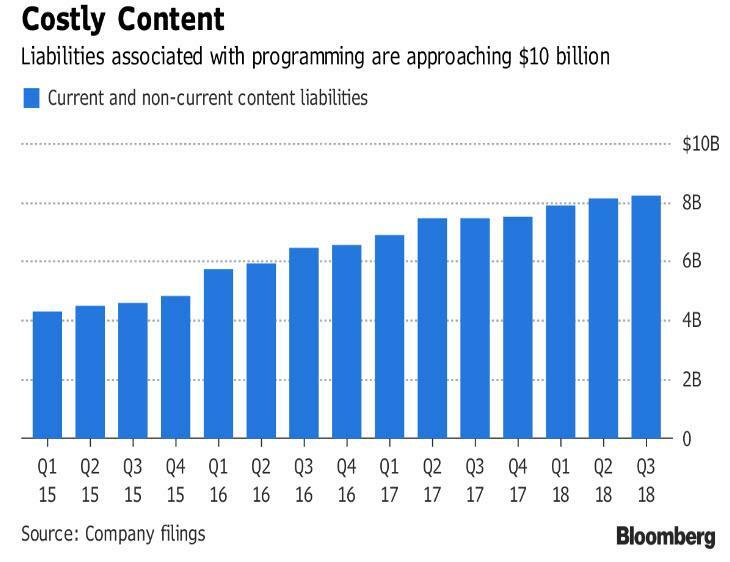 And, we note that 3Q streaming content obligations were $18.6 billion. "We recognize we are making huge cash investments in content, and we want to assure our investors that we have the same high confidence in the underlying economics as our cash investments in the past. These investments we see as very likely to help us to keep our revenue and operating profits growing for a very long time ahead." Of course, as long as subscriber growth is strong, Wall Street is willing to forgive anything. Under the hood, operating income is expected to slow as is revenue growth and US contribution profit. Will the market keep ignoring the EPS cut by morning?